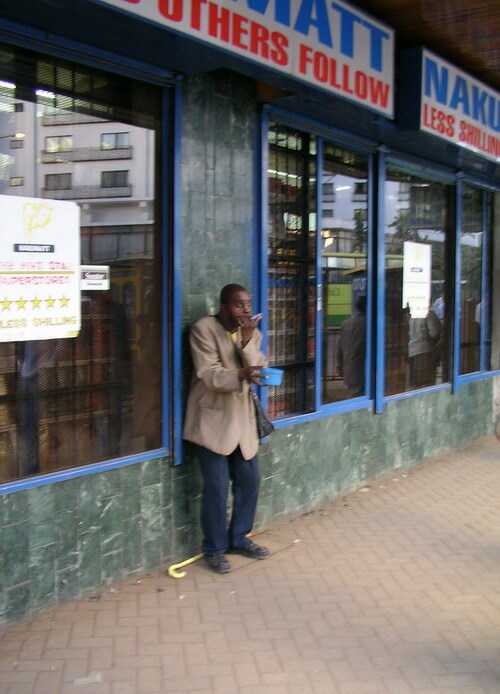 This diligent musician next to Nation Building in Nairobi needs deserves some attention, doesn’t he? I know A LOT of you gals ‘n’ guys out there “know” him from performing at that place (on a daily basis? )- but is there any story on him so far? Good Question but I wonder how many people have ever bothered to ask it, let alone assist him? I’m sure the Dept Manager of Nakumatt probably just passes him by without a word. He looks blind, is he? Breaks one’s heart. I was looking at this Pic once more and I realised that man has been begging in the city for a while now. I think when I was in Kenya he was situated near Uchumi at Kimathi Street, across the road where he is at now. Waoh 6 years and begging come rain or shine…sad and also makes me wonder “why I complain about trivia stuff when they are such people” and reason why able bodied men should not be at work but iddling on the street, one will never know. At least he is at work, asking for msaada and not stealing is something!